We were well aware it was coming, but today Microsoft finally says goodbye to Nokia branding for its Windows Phones. The first handset to omit the Nokia name is the new Microsoft Lumia 535, an entry-level device with two standout features: A 5-inch display and a 5-megapixel front-facing camera. Microsoft says it's been designed as an alternative to the smaller Lumia 530, and will be targeted primarily at markets like Russia, India, China and other parts of Asia. It will also see a launch in Europe (including the UK) sometime in the future, but currently, we're told there are no plans to release the phone stateside. Although Microsoft ranges a bunch of Lumia devices with sizable displays, most of these are aimed at the top end of the market. The Lumia 535 is intended to fill something of a hole in its current line-up, being a more affordable smartphone that still has a decent-sized screen to poke at. The 5-inch IPS LCD display is hardly worth bragging about, though, as it offers a miserly resolution of 960 x 540. Microsoft claims to have paid special attention to outdoor readability, and while our initial impression of the panel's color temperature is favorable, the low pixel count is pretty hard to ignore. 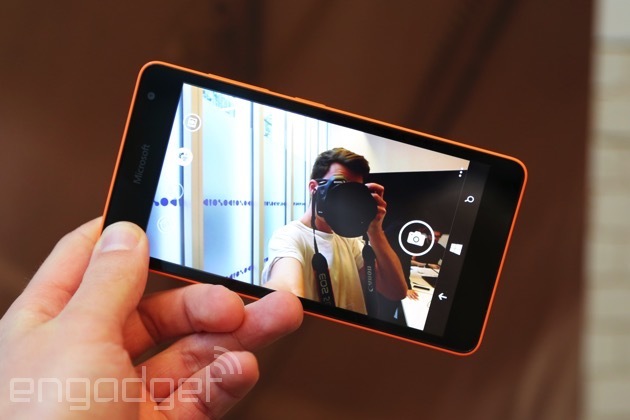 The front-facing 5-megapixel camera includes a wide-angle lens with a 24mm focal length, just like the Lumia 730/735. It sounds like it could be the perfect phone for selfie addicts on a budget, but the couple of shots I took during my brief time with the device seemed pretty average. Images appeared to come out dull, even in a well-lit room, but I was viewing them on the handset's low-resolution display, so perhaps that had something to do with it. Microsoft was showing off prototypes with pre-final software, too, so it's possible image processing will be improved. 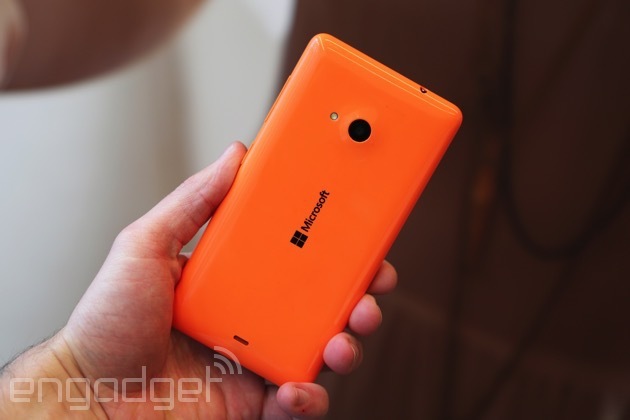 The Lumia 535 runs on a 1.2GHz quad-core Qualcomm Snapdragon 200 processor, with 1GB of RAM and a 1,905mAh battery. There's 8GB of onboard storage, coupled with a microSD card slot for up to 128GB of extra capacity. The device is also 3G-only, which is understandable given it's aimed at people who are unlikely to have a 4G data plan. The main camera is also a 5-megapixel affair, but with an LED flash, and like all Lumias, there will be several color options: Green, cyan, orange, black and white. These back plates are interchangeable and Microsoft will be offering flip covers in matching shades for those that like to give their handset a little extra protection. The handset's design doesn't stray far from the typical Lumia formula, boasting a matte or gloss plastic back, rounded sides and softened corners. It sits comfortably in the hand and the button placement on the right-hand side -- volume rocker up top and power button underneath -- should suit right-handers' thumbs perfectly. As for the Microsoft branding? It's... fine. The logos are small and unobtrusive, especially on the front. It feels strange to pick up a Lumia without Nokia's logo, but it's a sensation I suspect everyone will get used to pretty quickly. Microsoft says the Lumia 535 will launch later this month in Asia-Pacific territories, with Russia, India and China at the top of the list, ahead of Africa and Europe. The handset will sell for roughly €110 (around $135), although the price will vary between countries.